The Canal takes anything but a direct route as it bends around Sideling Hill, Town Hill and Green Ridge as it makes its way toward Cumberland. The towpath finally leaves Green Ridge behind here at Town Creek. Marking the spot, about a half mile up the towpath from the campsite, is the Town Creek Aqueduct. The 60-foot single span was one of 11 aqueducts on the Canal and was completed in 1849. 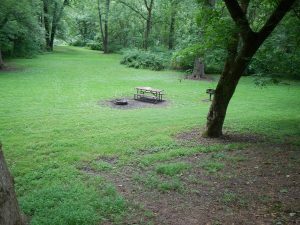 The free overnight campsite provides a portable toilet, picnic table, grill/fire ring and water source.